We are a family-run, garagiste wine cellar and vineyard. The cellar/garage is in the quaint village of Greyton, within the Overberg region. Originally founded by Andy Mitchell and his wife Vikki, daughter Olivia has taken over the reins and is now the head winemaker/farmer, assisted by her husband, Stefan Legavre. Andy and Vikki started their hobby in 2003, with Andy’s most favourite of wines, Syrah. The idea of starting with one barrel quickly evolved into six barrels, and despite the Mitchells' reputation as hardened drinkers, six barrels were a bit much! So the business began, with Olivia, a successful head chef, using her contacts in Franschhoek to start selling the first vintage of Andy Mitchell Wines. Olivia left the insane world of gluttony and moved naturally into the world of dipsomania. Taking over the main responsibilities in 2008, the chief tank scrubber developed her super senses to carry on her father’s dreams. Olivia will be the first to tell you that she still has lots to learn, but that is what excites her about the wine industry. She admits that she enjoys playing with different varieties, which most established farms don’t let their winemakers do. 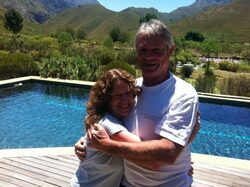 The backbone, the business-mind and the chief consumer of the Andy Mitchell Wines Chenin Blanc is Vikki. After Andy and Vikki met in England, they travelled to darkest Africa, along with Vikki’s daughters, Jemima and Melissa. They started North Sails in Cape Town, mostly due to their passion for sailing. Their passion for wine followed and combined with their love for a small village called Greyton, creating what is now Andy Mitchell Wines, winery and vineyards. The latest addition to the Mitchell family business is Stefan Legavre. Born in France and raised in South Africa, and his love for Olivia has led to a love of wine. Despite French roots in the restaurant industry, he comes from a sports background: surfing, cycling and worked as a massage therapist for various international sports teams. Now Stefan is learning through Olivia the techniques and methods of how Andy created his signature wines. Andy Mitchell passed away in June 2014. Vikki, Olivia and Stefan want their family passion to continue. Andy Mitchell Wines has now established a beautiful farm on the outskirts of Greyton, although the cellar is still found within the village. 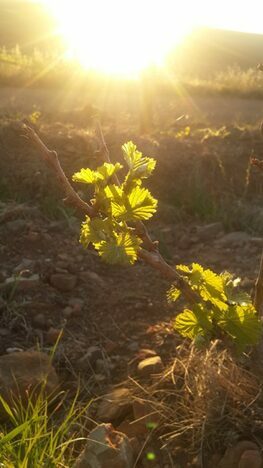 The grapes are sourced from their own farm, as well as other exciting wine regions in the Western Cape. They source the best suitable grapes from a variety of terroirs, for their incredible selection of wines. A little Grenache Noir to start the day. 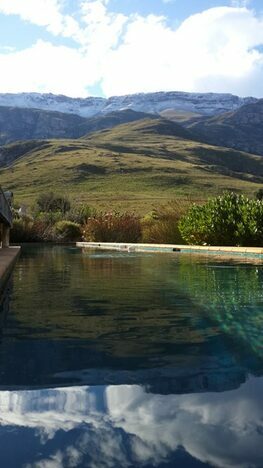 Andy enjoyed swimming even when there was snow on the mountains. Can you believe this is the view from the cellar!